You may have guessed already, but I love yeasted things. One yested thing that is a sure winner in everyone’s eyes, and that’s doughnuts! My mum used to make hundreds of doughnuts in catering and she is a bit of a perfectionist. She says if you love doughnuts you need a doughnut filler to get a good all round dough to filling ratio, and she’s probably right- but in my opinion a long piping nozzle will do. No matter how much she scoffs at my doughnuts(before “scoffing” them) , doughnuts will always bring back fond memories. They take me back to carnival time when the travelling fairs came to town, everything about doughnuts is wonderful. The sweet smell of them fills the air, and they just burst with jam- my most favourite part of the doughnut process is the sugar that gets stuck to your fingers! To make the vanilla sugar, pulse the vanilla seeds with the sugar in a food processor and store in a jar. Grab a sauce pan and gently heat the vegan mylk and marg together until the marg is melted, dissolve the sugar into the liquids, remove from heat and allow to cool until the mix is tepid. Whisk in the yeast and add to the flour. Part mix then add the salt. Knead a little in the bowl to bring the dough together then transfer to a floured surface and knead for about 8-10 minutes, until smooth and elastic, adding more flour as needed. Grease a bowl with vegetable oil and toss the dough gently in the oil to coat, cover with cling film and leave somewhere warm for about 1-2 hrs until slightly more than doubled in size. Pop the dough in the fridge over night- or at least 8 hours- and take the dough out the fridge and roll carefully out to 1/2″ thick on a floured surface. Using a 2″ cutter cut out little circles of dough and place on a lined baking sheet to prove for about 1 1/2 hours- 2 hours, until the dough has doubled back up. Grab a large pan and fill with the 1 ltr of vegetable oil, and preheat the oil to about 160c/325f. Make sure you have a bowl filled with a small amount of vanilla sugar, and a bowl lined with paper towels to absorb the excess oil. Pop a few bits of dough in the pan at a time and fry until golden brown on one side, then carefully flip and fry the other side. Using a slotted spoon lift the doughnuts outta the oil, draining off some of the excess, and toss about in the bowl of vanilla sugar, then transfer to the bowl lined with paper towels. Repeat until all the doughnuts have been fried and sugar-coated. 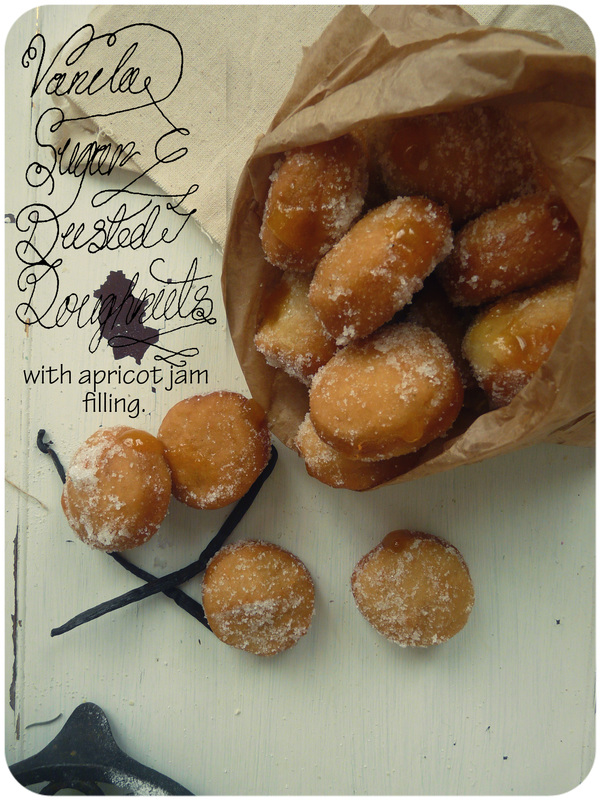 Once to doughnuts are cool enough to handle fill with apricot jam using either a doughnut filler, or a piping bag fitted with a long metal nozzle. This entry was posted in Breads, sweet treats, VeganMoFo 2013 and tagged baking, bread, dough, doughnuts, food, month, of, recipe, vegan, veganmofo. Bookmark the permalink. Oh wow they look perfect! I love that you’ve used apricot jam! 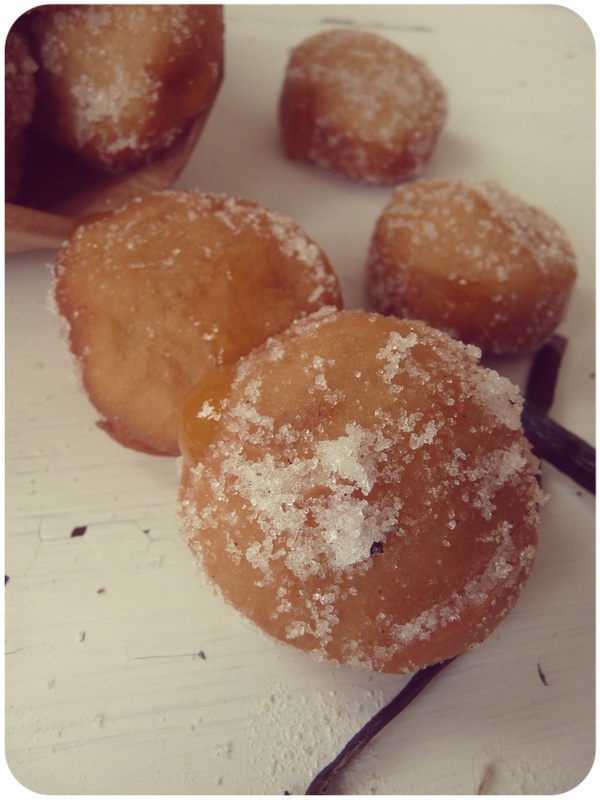 I love freshly cooked doughnuts when they’re still warm, perfect treat when watching fireworks or at a festival and its cold! 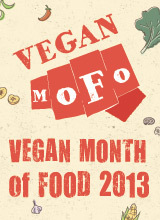 See this is what I totally love about Mofo – discovering amazing blogs like this one! I would like to start exploring the world of bread making so I’ll be following your posts closely. Great to find another UK blogger too. Don’t know where you are based but if you’re ever visiting Manchester my theme for this month is vegan eats in the Northern Quarter area of the city. Oh man, whenever I think I’ve seen the most beautiful of vegan creations from you, you create something else! Alex, you’re an amazing food artist and I do hope that you create a cookbook one day. Amazing. Definitely want to make these very soon! Proper filler or not, those look amazing! I really need to make donuts again, looking at these is just killing me. I may have to give in and eat some gluten – these looks SO FRICKIN GOOD!!! Oh wow! Those doughnuts look soooo yummy and tempting, Alex! In this cloudy weather we’ve been having, these will be a great snak to gobble up. Mmmmm. Mmmm, donoughts . . . . . But can you eat one without licking your lips? Holy Mother of YUM!! These little amazeballs look 100% perfect. Apricot jam is also my #1 favorite jam, so that makes me like them all the more. I am loving your blog this MoFo!!! these look like superstar donuts!